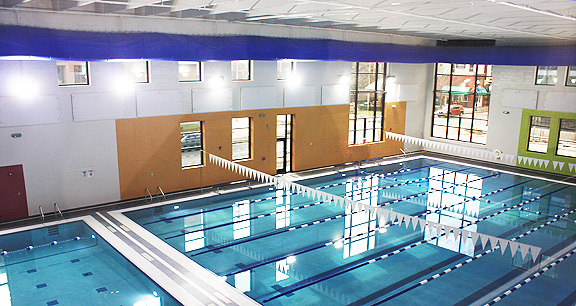 Project obstacles and solutions: The Kokomo Family YMCA has a new $16 million, 73,000 square foot facility. The Delmar E. Demaree Family YMCA includes an aquatic center, a three-lane walking track, weight and fitness rooms, basketball courts, an indoor jungle-gym, activity rooms for small children and community rooms for large gatherings. The new structure is across the street from the current YMCA, which has been its home since 1910. Weigand was the general contractor for the new building. The construction of the aquatic center included two pools. The pools were built with shotcrete that was pneumatically sprayed over a waterproof liner. IMI supplied 600 yards of concrete for the floors and walls of the pools. A stamped, colored concrete walkway surrounds both pools in a cobblestone pattern. They were colored with imix Spectra Quarry Gray and then highlighted with a dark charcoal release. IMI supplied 50 yards of imix Spectra colored concrete for the decorative walkways. Hi Tech placed and finished all of the concrete work in the pool area. Another 3,400 yards were required for the main structure of the building, including footings, floors, decks and pillars. IMI also supplied another 500 yards of grout mix for fills and masonry work on the building. Weigand did all of the concrete work outside of the aquatics area. The grand opening of the new Delmar E. Demaree Family YMCA will take place on February 29, 2016. For more information on using shotcrete in construction, contact the sales representative for the location nearest you. Click here.